Cut prepared chicken on portion pieces, rub with salt, red and black pepper, then fry chicken in butter till golden color. Shift the chicken in a refractory form, add pressed garlic, parsley, rosemary, bay leaf, sprinkle with flour, pour hot broth (if you do not have chicken broth, use water, but not bouillon cubes, they spoil taste of sauce), pour wine, cover form with lid, if you do not have it, cover form with foil, put in the oven for 1 hour, till chicken becomes soft. Then remove chicken from broth into bowl, cover, put aside. Strain broth in pan, add lemon juice, bring to a boil, let it boil over strong heat for 5 min, if necessary salt a bit. Whisk yolks with cream, stirring, pour half glass of hot broth from pan, then all this mixture carefully, always stirring pour in pan, as soon as mixture begins to boil shift chicken in it, and heat a bit, avoiding boil. 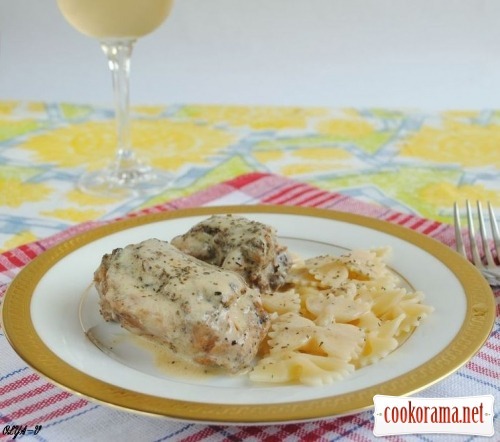 Top of recipe "Fricassee from chicken in Paris style"
Я так розумію, можна використовувати замість курки окорочка? І коли це все добро запихається в духовку, вогонь не збавляти чи поставити на мінімальний? можно конечно и окорочка, или лодыжки. Духовку на 180 градусов, так и готовить при такой температуре.